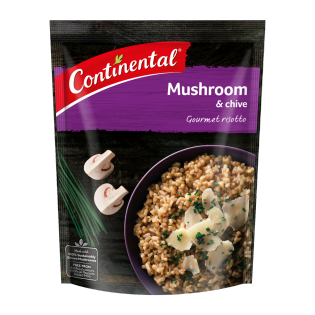 Continental's easy to make mushroom and chive risotto is made with carefully selected powerful flavours and expertly blended creamy textures. Learn more. Create the perfect summer dinner for the whole family with our steak with creamy mushroom and herb sauce recipe. Prepare and cook in just 40 minutes. This was delicious however i wish the serving size was larger. I recommend one packet per person. This is the most disgusting flavor that I have ever had the misfortune to put in my mouth. love the other rices and pastas that i have tried, but this is horrible. No stars, minus 10 if possible.